We have very limited quantity of re-certified, factory-tested, like-new trade-in DAC-2 DSDse units available. These come with a full 1 year warranty. Retail price $2549 each, get yours today for 35% off! currently only black available. Accurate conversion of music and sound from the digital world to the analog realm is the cornerstone of a top-quality system. For the discerning audiophile, we created our flagship digital-to-audio converter: the DAC-2. At the heart of the DAC-2 is the industry-leading ESS 9018 Reference Audio 32-DAC. Using the chip’s trademark ESS Time Domain Jitter Eliminator, the ESS 9018 utilizes an oversampling process that eliminates all of the clocking inconsistencies (jitter) found in a typical digital-to-analog conversion. The result is an information stream that’s cleaner from source to sound, free of artifacts. Combined with our proprietary discrete output stages, which optimize sonics, the DAC-2 delivers the absolute most accurate and musical sound. Defeatable pre-amp functionality allows audiophiles with 100% digital systems to completely eliminate the need for a pre-amp, reducing signal processing and increasing transparency. In addition to Coax, Toslink, and AES/EBU units, the DAC-2 also features a balanced I²S input that when mated with our PCOCC HDMI cables and a compatible source, yields unmatched sound quality. Proprietary USB drivers for all operating systems make installation easy and a compact footprint makes the DAC-2 the perfect fit for any system. When we built the DAC-2, we knew technology would change quickly. That’s why we armed our flagship digital-to-analog convertor with upgradable digital, output and USB boards allowing it to evolve with technology. As with the DAC-2, the heart and soul of the DAC-2 DSD is the 9018 ESS Sabre DAC, widely considered the best in the business. From there, we gave the DAC-2 DSD the added capacity to flawlessly stream files up to DSD256 files via USB. With an onboard USB to I²S platform that delivers digital information directly to the D/A convertors, the DAC-2 DSD offers critical listeners jitter free transmission of data. We increased the DAC-2’s USB PCM resolution to 32-bit 384kHz and added galvanic isolation to eliminate computer noise from the audio signal completely. Integer mode compatibility allows direct communication between the signal source for bit-perfect playback in Mac systems. Additionally the new DSD interface is driverless for Mac and Linux platforms, ensuring seamless installation. A simple driver install is needed for USB streaming from PC systems. The DAC-2 DSD means you can be confident that the ultimate USB technology is built into your DAC! As with the DAC-2 and DAC-2 DSD, the special edition DAC-2 DSDse boasts all the remarkable technology of its sister products including the industry-standard ESS 9018 32-DAC, DSD processing, and our proprietary discrete output stages. Enhancing the already stellar performance of our DAC-2 series, the DAC-2 DSDse includes an array of highly upgraded components: Vishay Z-Foil resistors, ultra-low noise discrete regulators, ultra-fast recovery Scottkey diodes, premium grade inductors, green OLED display and a premium upgraded fuse. 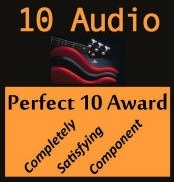 The culmination of these enhancements is refined audio performance down to the minutest nuances. Delivering the highest quality audio of our digital-to-analog convertors, the DSDse is like the DAC-2 on steroids. As with all our DAC-2 products, the DSDse great value for your dollar and carries a five-year warranty. Accuracy and overall quality of the master clock are crucial to obtaining optimum sound quality. The standard clock is no slouch but you now have the option to upgrade to the highest grade component available in its class. Implementation of this femto grade clock optimizes audio quality by lowering phase jitter by over 80% as well as greatly reducing phase noise in the digital circuit. Clocks of this grade are typically found in DAC's retailing for $5K or more! The DAC-2 DSDse model comes with this clock standard and for a modest fee you can select the upgraded clock during the checkout process for any of our DAC-2 models! you should mate whatever you want to the DAC-2 and move on with your life, for it's that good. 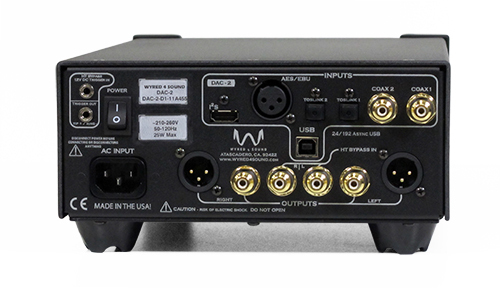 The W4S DAC-2 was easy to set up, easy to use, and sounded fabulous. it provides fine detail and superb resolution perfectly integrated with musicality. Wyred DAC2 makes for a remote-controlled modern music source that not only slaughters legacy digital on convenience, it should sonically outperform any $3.000 CD player you care to name. I don't know what kind of filtering the W4S DAC-2 uses but, as Goldilocks said, "It's just right". Like I said, I'm buying the demo. If space is the final frontier, the DAC2 will lay out quite the night-sky canvas if it was rolled up in your CDs. The soundstage is vast and uncolored and the leading and trailing edges of notes have great attack and sustain. The Wyred 4 Sound had good body and weight that added a degree of realism to music reproduction not often found with DACs at this price. I frequently felt connected to the music when listening with the DAC-2. The musicians had a strong presence in my room created in a spacious and airy sound scape. The DAC-2 DSDse combines high-end sound and a boatload of useful features including the ability to seamlessly play nearly every file format available. Frankly I am blown away overall..... I have not heard the older DAC2 --- but your DSDse design around the ES9018 here is just stellar sounding. It is truly in a league of its own....and I am getting the impression that you have taken IC-based DAC design to just about the limit to what is possible with your attention to detail in the current DSDse. To do appreciably better, some significantly different approach will be needed. I cannot stop listening to it .....I just want to throw more and more at it....and never leave.